This top of the line automatic pool cover pump is designed to sit out on the center of the cover and turn on automatically when water needs to be evacuated off of the solid vinyl pool cover and off when all the water is gone. 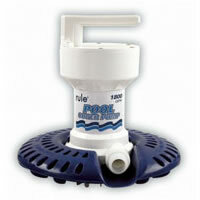 The Sump swimming pool cover pump moves up to 1800 gallons of water every hour. Water is pumped off of the cover through a garden hose which is hooked directly to the pump unit. This method minimizes unwanted particles entering the pool since the cover is completely solid. However, it does require a little energy and an electrical outlet to provide power to the pump whenever the pump turns on to remove the collected water. This pump is a $275 value we give to you for $195. If you are interested in this automatic pool pump you can select it while ordering your solid vinyl pool cover to replace the mesh drainage panel.